While,Sonia Gandhi’s son-in-law,Robert Vadra,was given a clean-chit by the Haryana govt on allegations framed by IAC chief Kejriwal,on him. BJP’s Nitin Gadkari,on the contrary,seems to be getting more and more into trouble after Kejriwal’s allegations of scams on him. 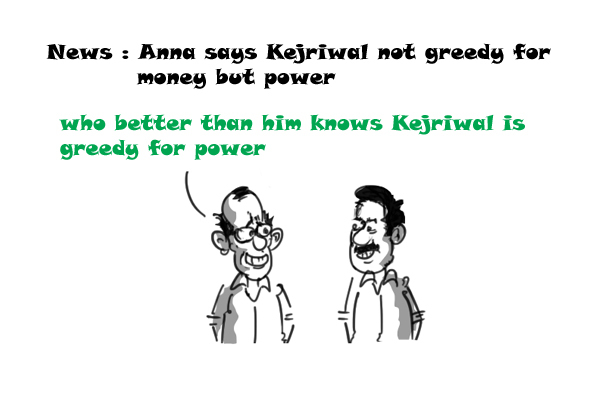 Anna-Kejriwal is not greedy for money but may be for power ! Anna Hazare, the Gandhian activist, who was the boss of India Against Corruption Movement and also the boss of Arvind Kejriwal feels Arvind may be Power Hungry although he also claimed Arvind is not greedy for money ! They parted ways after Arvind decided to get into politics in order to curb corruption which Anna did not agree on! Well,its human to be greedy provided it is directed towards a noble cause. Modi refers PM as ‘Moun’ Mohan Singh ? Moun in Hindi means ‘Silent’ and thats how Gujarat CM prefers to address PM Manmohan Singh.No matter,what Mr Modi says about the PM,never has Manmohan Singh responded back in agitation,not only against Modi but anyone who has ever criticized Dr Singh for remaining speechless on all major issues related to the country.